I’ll be updating this post with the rest of your brilliant submissions to our “Made of Imagination” project with MTV and Sony Xperia. 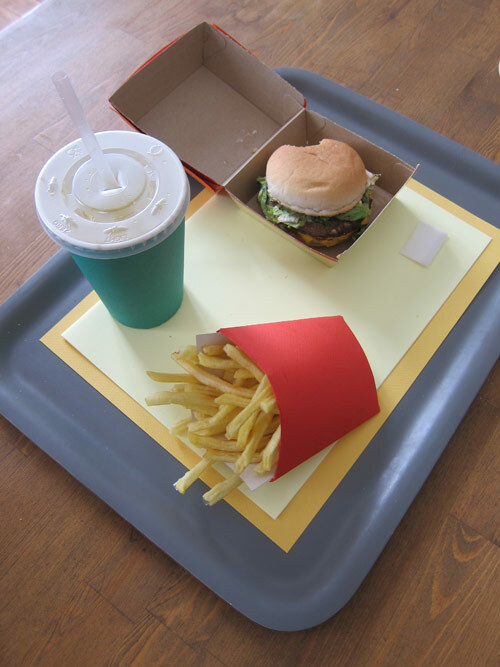 The instruments: Dried hamburger drum, soda pop violin, french fry pan flute, and salt shaker. 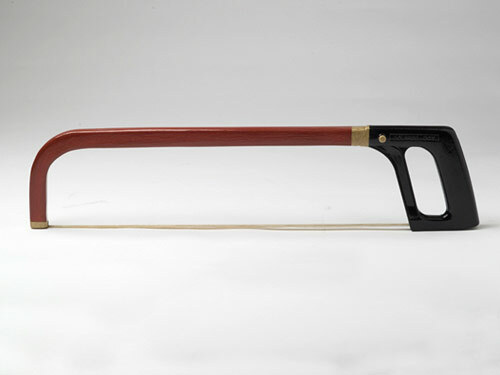 Bow for violin made out of a hacksaw. It’s an interactive box with spindles and a hand crank. 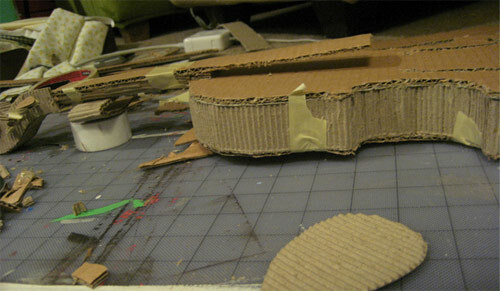 There are two guitar wires strung across the front. 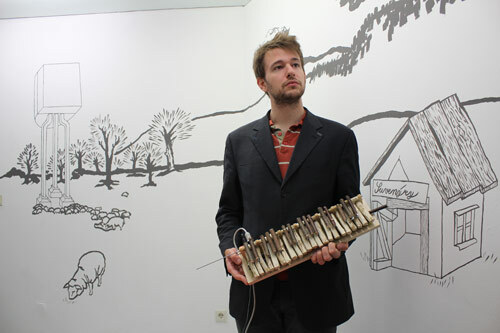 Inspired by the first ever beat box made in 1856 by a Swiss gentleman near the Swiss/German border. That last part is definitely not true. 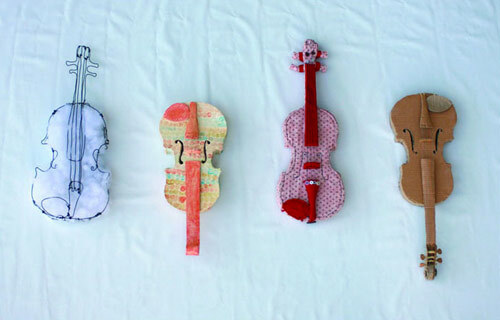 The instruments: violins made of cotton, stuffed fabric, buttons, string, and cardboard. 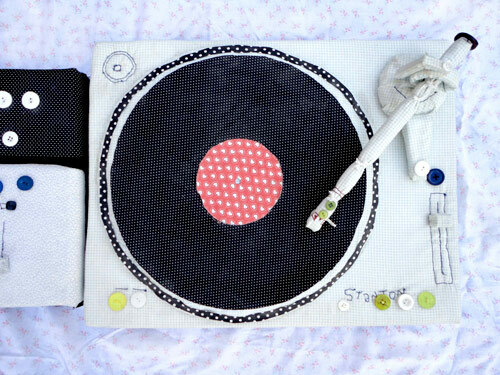 Turn tables and mixer sewn together with stuffed fabric and buttons. This was originally some portable-radio type toy with 4 buttons, with drum sounds. I changed the button contacts to metal sponges and car antennas, all tied together with wonderfuls crocodiles clips. Playing along with it is a 555 oscillator, executed by Isis Abigail, using herself and a Plectranthus Australis plant as variable resistor. 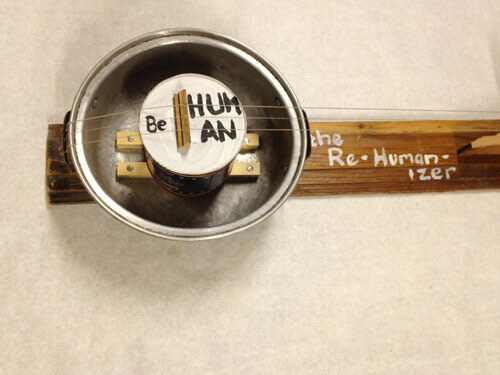 The ReHumanizer is an unholy cross between a diddley-bow and a lap steel made out of an old stock pot and a tobacco tin and a piece of moulding from the Habitat for Humanity ReStore in my area. 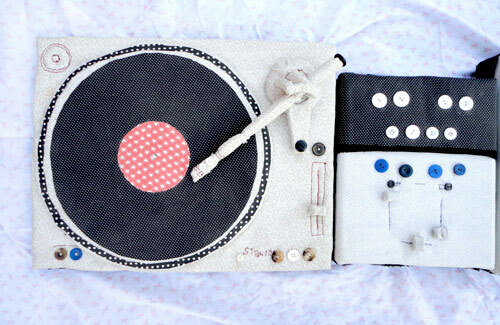 Floating Record Player. 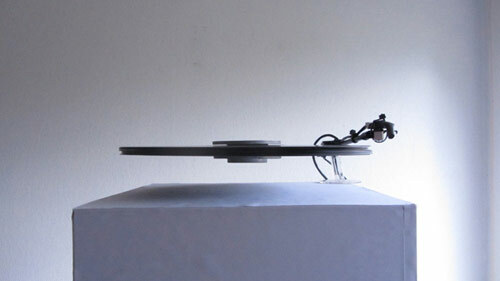 7 vinyl records are suspended in the air by electromagnets. A tonearm is mounted with an optical sensor which picks up the light patterns from the surface of the record. 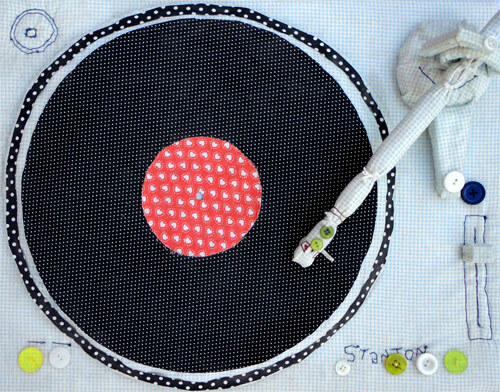 There is no needle touching the record. 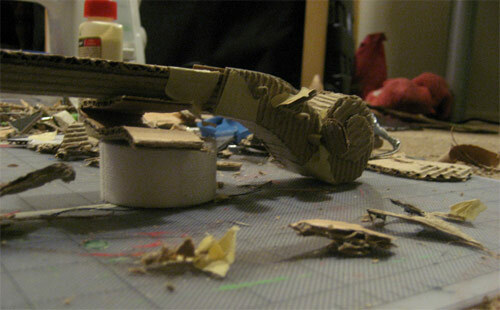 The optical sensor acts as a virtual stylus hovering above the grooves. 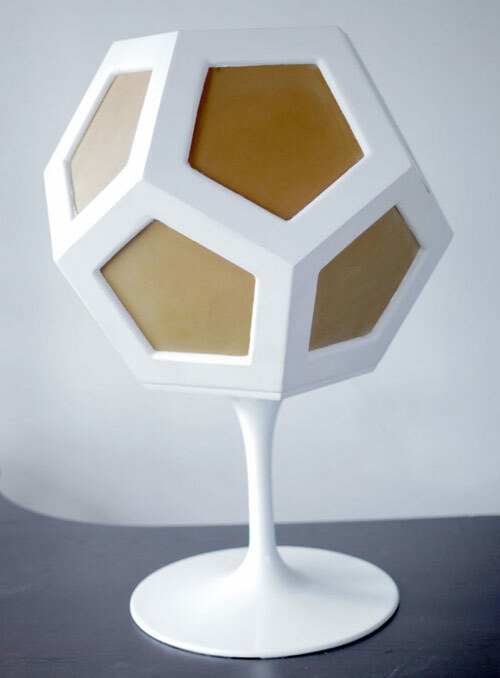 Sounds are processed in a sound-generating software program and amplified through speakers. The DF-I consists of 4 stepper motors, 4 piezopick-ups, and one controller. The name DF-I can be traced back to the abbreviation “DeFi”, which stands for defibrillator. 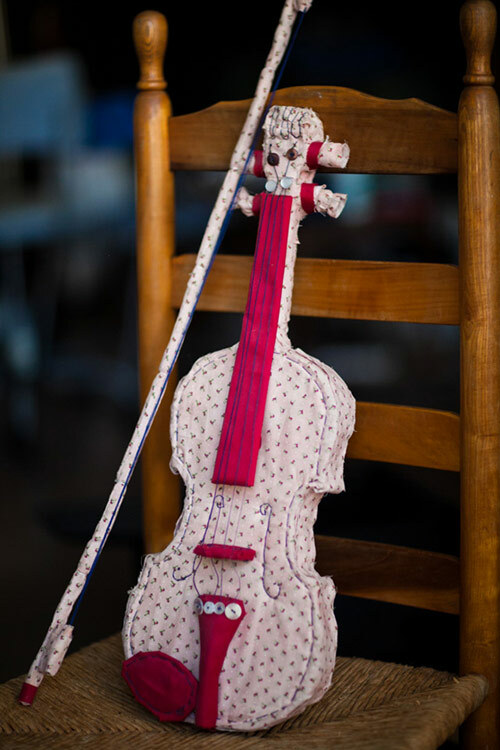 Since a defibrillator can be used for resuscitation attempts, the DF-I can also be used for musical resuscitation attempts on almost every object. 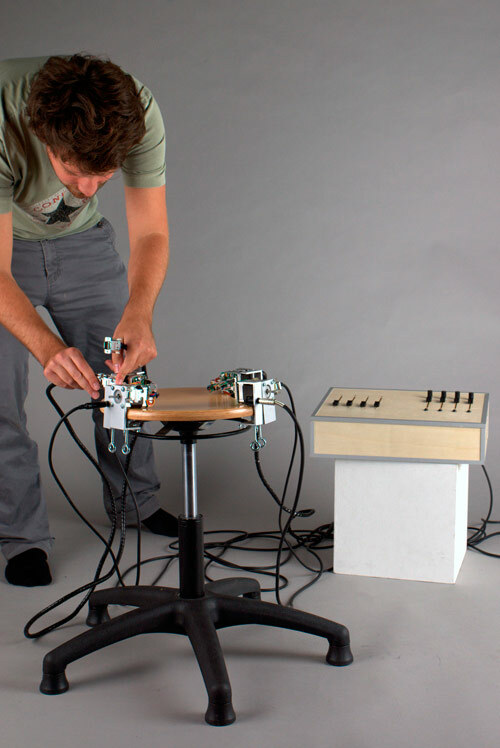 The stepper motors generate the sound. The surface of the object transmits the sounds to the pick-up. 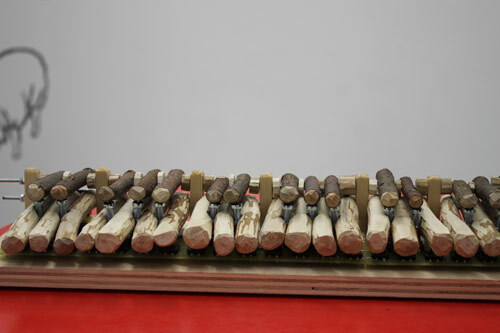 Doki Doki is a highly tactile wooden digital hand-drum with five active surfaces and a built in accelerometer. 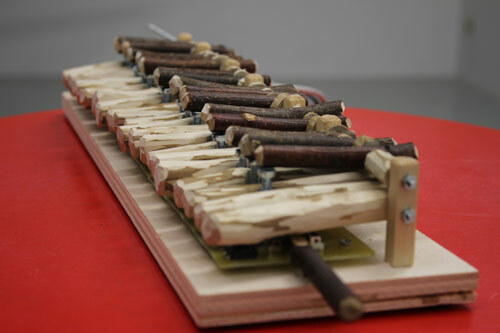 It offers a very open and experimental way of producing and performing music. 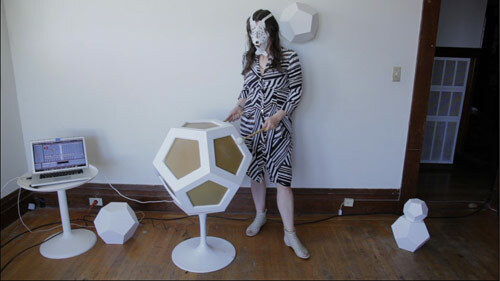 The Dodecahedrum Machine is made out of a wood frame, aluminum base, natural rubber pads, midi triggers made from steel sheeting, piezo mics, and foam. 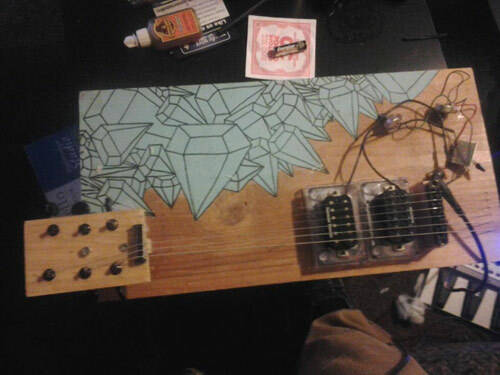 The Lunetta Guitar is a CMOS Synth driven 8string patchable/programable Robo Guitar capable of playing itself. I’ve taken multiple strands of dental floss and made guitar strings from them. For the thicker gauges of string I used more strands of floss. After developing the technique for making these dental floss guitar strings I contacted Ewan Dobson, a very talented guitarist from Toronto.